Little did I know that raising my hand 2 years ago to volunteer at a PTA would result in being one of the people organizing the 2013 haunted house at Vintage Parkway Elementary School. My son, now in 2nd grade thinks “it’s cool” his dad is building the haunted house, but tells me, “I won’t be scared.” With virtually no props and no experience designing and laying out a haunt I was not really sure what I was getting into. I had some desire to take the responsibility in 2012, but decided against it. What made the difference this year was being a board member with the PTA and making the acquaintance of Mark, now PTA vice president, who has 2 kids at the same school. We were more less tasked with the job of setting up the haunted house for the Harvest Carnival, which takes place the Friday prior to Halloween. That provided us with about 6 weeks to design a layout and take inventory on what we would need to make this haunt successful. 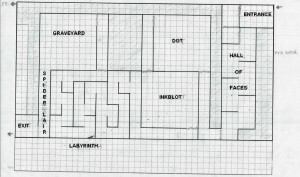 While it took the better part of 2 weeks, the layout is now finalized, but it wasn’t easy and I am sure looking back on our first haunt there will be changes next year. We started with a 24′ x 45′ stage, which has exits at opposing corners (and 1 emergency exit) and a row of cabinets 16′ long, 8′ high which can not be moved. For the haunted house we pulled closed the hard-sided curtain at the front of the stage to enclose the area and remove or store as much of the equipment that’s on the stage. The original design I started working was based on a 30′ x 45′ stage, as I miscalculated the stage when the curtain was closed. The first designed used every square foot of the stage, but something about the layout didn’t sit right. It wasn’t until I posted a question on Halloweenforum.com for “Suggestions on this layout?” I didn’t receive quite the number of responses I expected, but did find the feedback worthwhile. While I didn’t note it in my post, safety is ALWAYS the top priority when it comes to an event such as this. I was reminded of that fact, “Your main concern should be safety.” Aside from that comment someone mentioned, “the cemetery seems a little out of place to me in the middle” and suggested “more of a natural progression to do faces, inkblots, dot room, labyrinth, spiders and end with a cemetery.” With that comment in mind I started walking through my layout and it didn’t seem flow very well. I had a few areas that were odd dimensions that I couldn’t figure out what do with them. I also thought the original layout was to complex, especially the labyrinth, which took up nearly 17′ x 24′ of the stage! The other concern on my mind when I posted on HF.com, not having enough props to fill a haunt of this size. With that in mind, along with some Internet searches I began working on a new version of the haunted house. Similar in layout, I kept the same rooms from the first design. In order to decrease the “dead space” I moved three temporary walls in creating ‘actor corridors’ to allow parents and kids involved in the haunt to move easily to different areas. This decreased the amount of overall floor we had to work with. I ran the first design by friends on Facebook and it was well received. One of the biggest differences was the size of the labyrinth, now downsized to 12′ x 14′, not nearly as complex as it once was. Strangely enough it was still the last area I developed. Two other rooms were re-sized to 10′ x 10′, a third was increased to 10′ x 12′ with two corridors remaining unchanged. This new design also allowed for a ‘storage’ area accessible from the actor corridor. In future events this area could easily be developed and worked into the haunt. Another concern, the number of rooms or haunts in the layout. Initially props were a huge concern knowing the PTA didn’t have many on hand, there was very little money in the budget to offset our costs and chances were good we weren’t going to see many donations or people loan us their Halloween stuff. My personal props can be counted on one hand and Mark had some stuff at his place. Thankfully talking to a few parents, we scored a few props that helped create that much needed Halloween ambiance. With a new layout on paper I moved the rooms around to come up with a layout that seemed to flow much better. Gone were the dead spaces from the previous version and I genuinely felt this was a better designed floor plan that allowed for different options if we ran into problems, such as running out of time to develop a room concept or run out of money in the budget.